The Zoo is thrilled to welcome Oscar, an American badger from the Hemker Park & Zoo in Minnesota, to the Badger State. Zookeepers report that he is adjusting well to his new environment and loves to dig lots of burrows. Currently one year old and weighing around 22 pounds, Oscar is young and timid, spending most of his time staying underground. He has already dug multiple burrows, keeping busy in his new home. Oscar likes to make an appearance near the end of the day, as badgers are nocturnal and are active mainly at night. Oscar loves to dig burrows and stay cool underground during the day. While adjusting to his new surroundings, Oscar is acting cautious when he is above ground. For enrichment, zookeepers have given Oscar some treat foods, but they are still trying to figure out his favorite snacks. Zookeepers have also given him scents and feathers, but have seen little response so far. Oscar’s diet consists of ground meat and dry dog chow, as badgers are carnivores who often catch their food by digging for it. American badgers are found in open grasslands, prairies and plains, remaining active year-round, besides taking some time off in the winter months to sleep and get some much needed rest and relaxation. 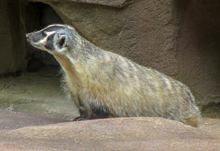 The American badger population is not considered to be threatened currently. At times, badgers will be seen hunting together with coyotes. The odd couple works well together as coyotes are able to chase down their prey, while badgers are able to dig for their prey if it goes underground. Oscar continues to make more appearances during the day. 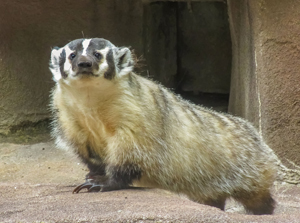 To better your chances to sneak a peek at our new badger and celebrate Wisconsin’s state animal, visit Oscar at the end of your visit here at the Zoo.